"This is my Dad's recipe and could not be easier. Just remember, turn off the oven and don't take them out or even open the door for 1 hour." 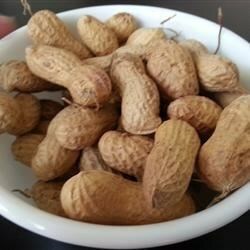 Arrange peanuts in a single layer on a cookie sheet, and place in the preheated oven. Turn oven off. Leave peanuts in oven for 1 hour without opening door. Serve warm or at room temperature. Feel-good crisp & spicy snack! Love roasted peanuts. Make sure you read the directions, the oven is turned off while the peanuts are in it. Came out perfect! This works better if you put the peanuts in the oven, then turn it on. Just be sure to turn the oven off when it reaches 500 degrees, then leave them for an hour. The temperature is too high. 400 degrees is far better than 500.